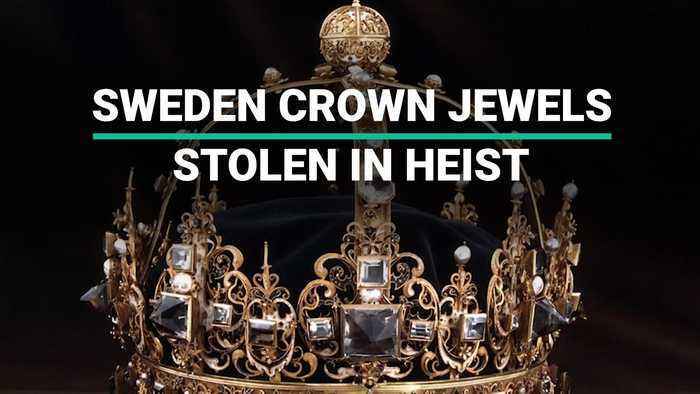 Daring Thieves stole three of Sweden’s crown jewels, dating back to the 17th century, on Tuesday in a bold daylight heist at Strangnas Cathedral. The cathedral was open to visitors at the time and a lunch fair was being held in a side chapel. Two royal crowns of King Karl IX and Queen Kristina, as well as an orb, are missing and the thieves are still at large. They fled the Cathedral first by bicycle and later by a motorboat. An international investigation is ongoing. Police mobilized a massive search operation with a helicopter and boats to find the perpetrators and recover the stolen items, but they have so far been unsuccessful. Police said there had not yet been any arrests following the theft of stolen Crown Jewels from Strängnäs Cathedral in Sweden where the items were on public display. Reportedly, a witness told Aftonbladet, a Swedish evening newspaper: “One of my friends saw two people running. I saw the boat just there, a white little boat, with a motor on the back. This is not the first-time royals have had their precious jewels targeted and stolen. Attempts to steal the United Kingdom, Saudi Arabia, France and Sweden’s crown jewels are common practice. These Jewels are specified as an invaluable national treasure and the theft of these items lead to national security. Arresting the perpetrators and recovering the stolen items demands an accurate identification of the information as the name and pictures of Thieves, escape routes, flaws in Cathedral and other relevant information about the theft. When reliable and authentic intelligence is a pivotal part of closing the investigation, existing methods such as surveillance and black-market tips prove time-consuming and costly. Retrieving the Crown Jewels require cutting edge scientific technology that produces intelligence/leads that are virtually infallible. Advancements made in neuroscience and cognitive psycho-physiology provide law enforcement with a breakthrough solution for investigatory practices. iCognative plays an instrumental role in delivery of truth and justice through enhancing intelligence collection and evidence verification. Only iCognative technology can satisfy the need for the requirement with an accuracy of 99.9%. This modern technology sets a unique standard in security solutions that can support law enforcement in solving complex cases. iCognative can lead this crucial investigation in the proper direction by empowering investigators with the right information at the right time. A 45-minute test conducted by detectives on suspects or witnesses would produce valuable and precise intelligence/leads for the investigating agencies. To conduct a test on a suspect, a test case needs to be built with both known and confidential information about Crown Jewels theft (only known to the perpetrator and investigating agencies), is input into the iCognative system. For example, in our case, information such as the date and the time of theft; names and photos of perpetrators; escape route; white motor boat, description of 2 men reportedly seen by witness, any inside man; information on selling the jewels, etc. This information, used as stimuli in the form of words, phrases or pictures, depending on its availability. These stimuli will be flashed to the suspect on a monitor. Technology collects the brain responses to the stimuli in a non-invasive fashion, analyses and detects with over 99% proven accuracy if the information is present in the brain. The result of the test is given within a minute and will reveal which suspect or how the suspect is connected to the theft case. Now, the investigators can solve the case by finding out the truth. Once the iCognative test is conducted, it can be precisely determined who the perpetrators are, how they planned the theft and the specific whereabouts of Crown Jewels. iCognative sets the benchmark for innovation and performance as it is a highly advanced, non-intrusive, and affordable security solution, posing great value for law enforcement.